Loving any excuse to maffick (follow the link as this is a word you will want to know and use), I take great joy in throwing parties. Two young daughters give me a twice-yearly excuse to invite friends and family over for birthday celebrations. A fair amount of planning goes into the food for these parties. Knowing my youngest’s seventh birthday approached and her family party was on the calendar, I laid awake one night wondering what to do for the cake. (My husband notes that many folks buy birthday cakes at bakeries–Costco cakes are indeed divine–or whip them up with cake mixes, but for many reasons, that folk is not me.) While I very much enjoy making from-scratch cakes for family birthday parties, I am not known for my cake decorating skills. 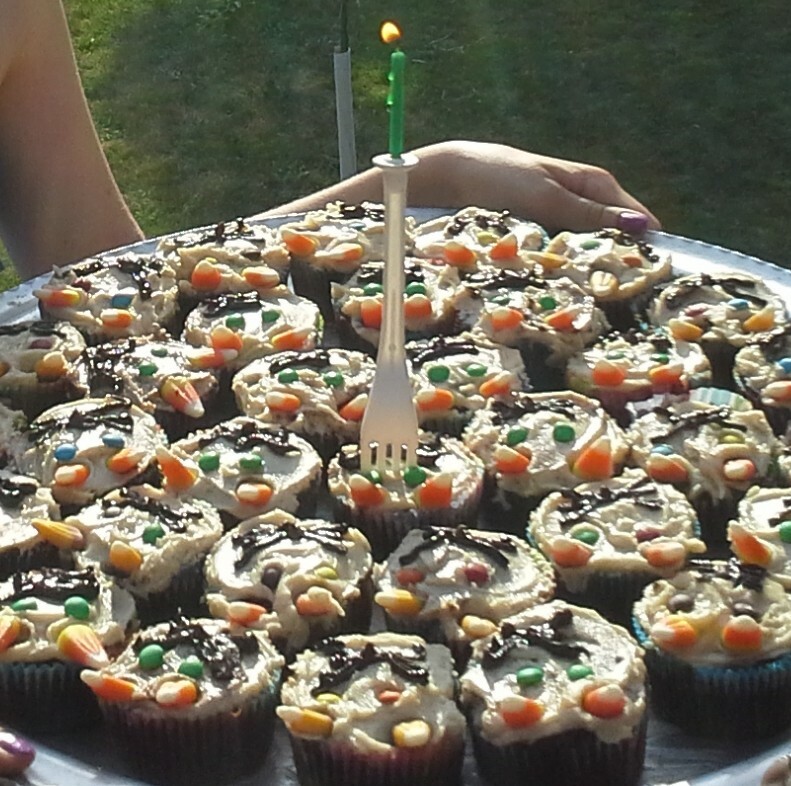 Exhibit A: These cat cupcakes taste good, yes, but they also look a wee bit scary. While effort has gone into improving my cake decorating skills, I’m still better with ideas than implementation. As I lay there contemplating cakes that night, keeping in mind my daughter’s request for a pink and purple Little Pony cake, I envisioned baking the batter up in 13×9-inch, 11×8-inch, and 8-inch square pans. 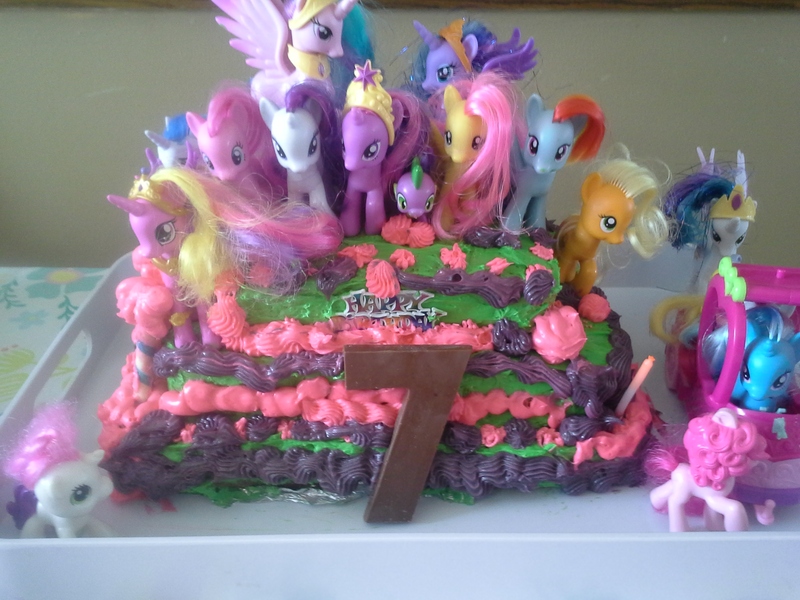 If the cakes were stacked bottom-up from largest to smallest, then filled and frosted, could we call it a hillside on which to place a few of her precious Little Ponies? When I posted the above photo and idea on deLizious facebook and got an enthusiastic response, I knew I was on to something. A friend who commented offered the services of her daughter, who has taken multiple cake decorating classes and is also a friend of my eldest. Knowing I had help, I fully committed to my hillside pony cake. 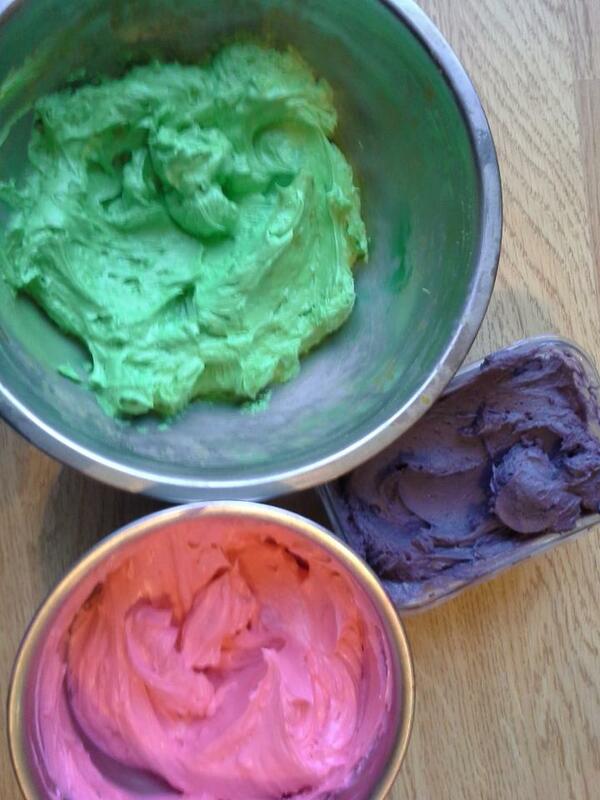 The day before the party, I made a crazy-good batch of French buttercream (from Rose Levy Beranbaum‘s Cake Bible) and gave the birthday girl free rein with the icing colors. I was wowed by her sense of color. could there be any more ponies? 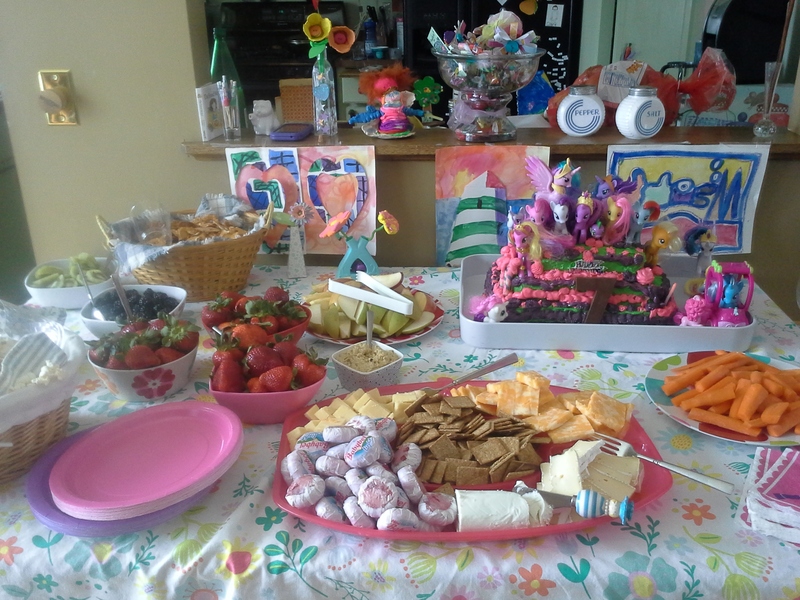 Because the party was all about ponies, I served up a spread of grazing foods–popcorn, cheese, crackers, fruits, carrots, hummus. (My oldest pointed out that horses don’t actually eat most of these foods, but as hay wasn’t an option I stuck with my original plan.) So in addition to the cake making folks smile, there was plenty of finger food to munch on as well. 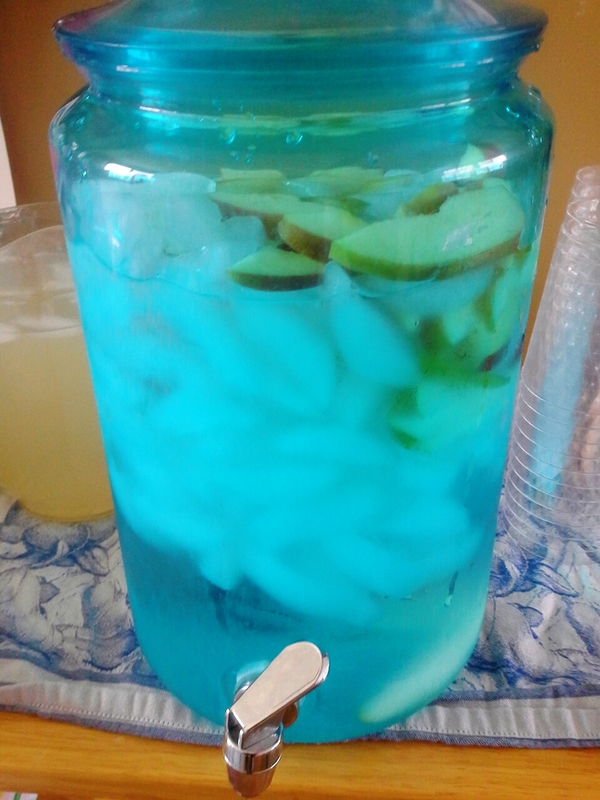 (And we musn’t forget the fruit-infused water: I subbed in a sliced apple and handful of blackberries for the more-often used lemon or cucumber slices.) It gave me great joy to see friends and family visiting and laughing and eating the foods I’d had so much fun putting together (with help from others, yes). This led to a bit of pondering and the realization that foodforfun, while always about cooking and baking and food and drink, is at its core really about wanting to share happiness. (same goes for deLizious facebook) We all have our vehicle–some love movies, some music, some gardening, some sports. But in the end, we’re all sharing happiness. I like that thought a lot and put it out there even in the wake of what seems like so many recent tragedies. I’m going to remember and honor the sad things, yes, but will focus on celebrating the good (thanks, mom) and I raise a glass of fruit-infused water and invite you to join me. 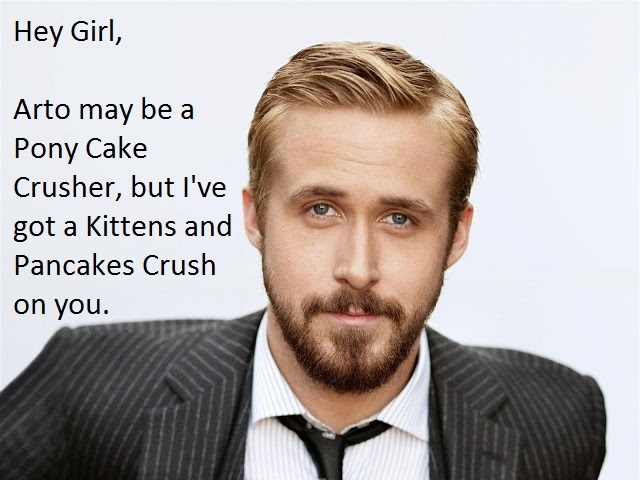 Why is Ryan Gosling here? This is why. My mother-in-law clipped a recipe from her local paper that grabbed my attention in a big way: Spiced Chocolate Whiskey Lava Cake. The spices in question were freshly cracked black pepper, ground ginger, and cayenne. A recent purchase of large blocks of chocolate as part of a wine tasting “kit” meant I had the 8-ounce block of 60% dark chocolate. Outside of the mandarin orange zest, all ingredients were on hand. Expectations were high as I started melting the butter and chocolate. But here’s the thing: I was balancing the project with other Sunday evening tasks–laundry, picking up around the house, getting kids to bed–so ended up with a good but not great final product. My first mistake was thinking I would sub lime zest for the orange zest. I had lime zest stored in the freezer, which would save me the step of zesting enough (regular as I didn’t have mandarin) oranges for the 2 tablespoons I’d need. As I emptied the small ziploc of what I thought was lime zest, it just didn’t look right. A little taste told me that I was putting frozen pesto (!) into the chocolate cake batter. Not about to give up on all the expensive ingredients I’d already stirred together, I removed the few clumps of pesto that had made it in to the chocolatey batter, rationalizing that this was how new recipes and flavor combinations are discovered. Maybe a hint of basil would make this cake even better? I forged ahead, deciding to use fresh orange zest instead of hunting down the frozen lime zest. Two oranges were freshly zested into the batter and I moved on. 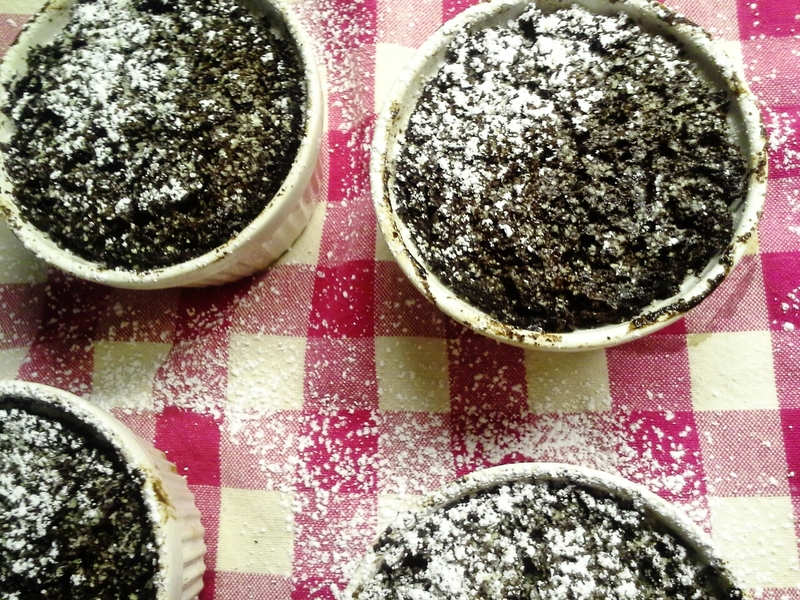 Filling the four 6-ounce ramekins and one mini cheesecake pan, I baked the cakes for the 13 minutes given in the recipe. A quick peek in the oven showed butter bubbling up furiously and pudding-like cakes that looked decidedly undone. At each oven peek, the butter was still bubbling, so I’d leave it alone and come back a few minutes later. After 25 minutes, the cakes looked done (bad sign–only the sides should have looked done), so I removed them from the oven, bubbly butter and all. Out of the heat, the butter subsided and the cakes looked lovely as could be. I knew they had to be overbaked after all that time in the oven (no lava! ), but turned one onto a plate and cut into it just the same. While the cake had a nice crumb, it released no river of chocolate. 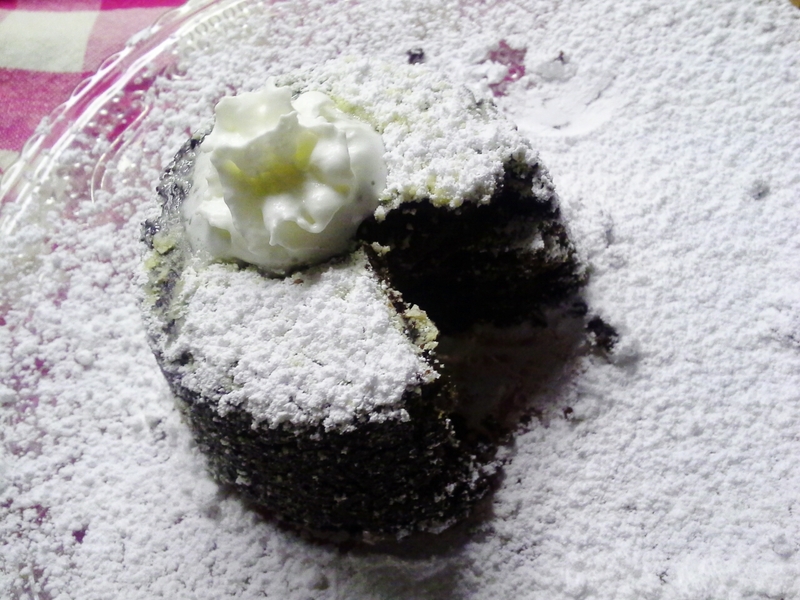 Still delish, the chocolate cake was rich without being overly so. And the orange zest was bright and fresh–lime zest would be fun to try, but orange seems the better choice. There was not even a hint of whiskey, so I’d switch to a stronger tasting booze (bourbon!) when I give the recipe another try. I also wondered why I wasn’t being hit by the spices–where was the ginger, cayenne, black pepper? While the ginger and cayenne were (very) faint background notes, I realized I tasted no black pepper because I DIDN’T ADD ANY. That ingredient somehow slipped by me–shoot. So I now have a game plan for the next round: Use orange zest–though a hint of basil wasn’t a horrible thing–or sub in lime zest if I must. But absolutely no pesto under any circumstances. Add 1 teaspoon freshly ground black pepper per recipe instructions and bump up the cayenne and ginger by a pinch or so each. Cut back on the butter just slightly–there’s too much butter if it’s still bubbling up 20+ minutes into baking. Don’t wait for said butter to stop bubbling to take the cakes from the oven. And sub in bourbon (maybe 4 tablespoons instead of 3 since I’m cutting the butter a bit) for the whiskey. Even with all of the mistakes made, these cakes were still divine. But they could be and should be so much more. (Though the fact that they were not is due to my multitasking more so than any recipe faults.) An optimist by nature, I’m giving myself another chance with this dessert with the amazing name. Expect a report when I do! Many blogs have featured family holiday traditions of late, and they’ve been great fun to read. A born-and-bred midwesterner, I only have experience with how it’s done in these parts. I’ve enjoyed reading Attempts in Domesticity’s tales of headcheese and pickled herring (neither sounded tasty to me at first, but her posts made me want to at least try these “delicacies”), Canapes and Chocolate’s gorgeous southern-style apps (though C&C writes from Seattle, she seems a gracious southerner at heart:-)), Lilly Sue’s holiday brews, Northern California’s produce, flowers, and sunshine–a far cry from the snow and cold I know in Minnesota–from Putney Farm. My holiday traditions, though delicious and much-loved, are fairly standard and won’t rock anyone’s culinary world. With one exception: my mother-in-law’s cranberry cake. She’s made it for New Year’s and the occasional holiday celebration since I’ve known her (over 20 years now), but it goes back further than that. The original recipe came from her Favorite Recipes of Home Economics Teachers, Desserts Edition cookbook (circa 1963) and she tells of how she chose this recipe to make for her first Christmas dinner as a young bride. Her lucky dinner guests demanded she continue making it and she’s done so for nearly 50 years. This is my mother-in-law’s signature dessert. The cake is golden, buttery, and studded with crimson cranberries. It’s a good cake for sure, nearly a pound cake but not quite, but what makes this cake over-the-top sublime and gloriously decadent is the butter sauce. Hoo boy. It contains a million calories a spoonful, I’d imagine, but is so good that this doesn’t seem to matter when presented with a pitcher for pouring. Of course the sauce is dreamy over ice cream–or simply spooned from a jar–as well. 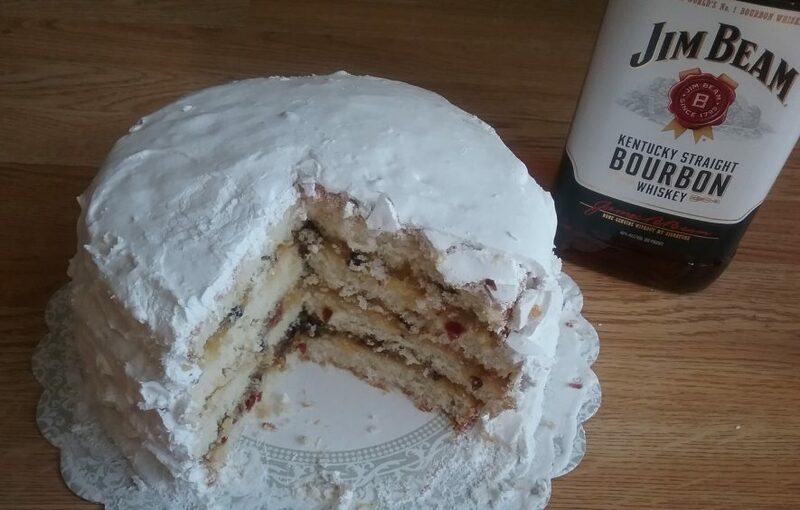 With this cranberry cake recipe, I wish everyone a Happy (and delicious) New Year. Thank you for sharing your traditions with me. I’d love to hear more, so please give me a holler here as a comment or on deLizious’ facebook page. Heat oven to 350°F. Grease two 9-inch loaf pans. 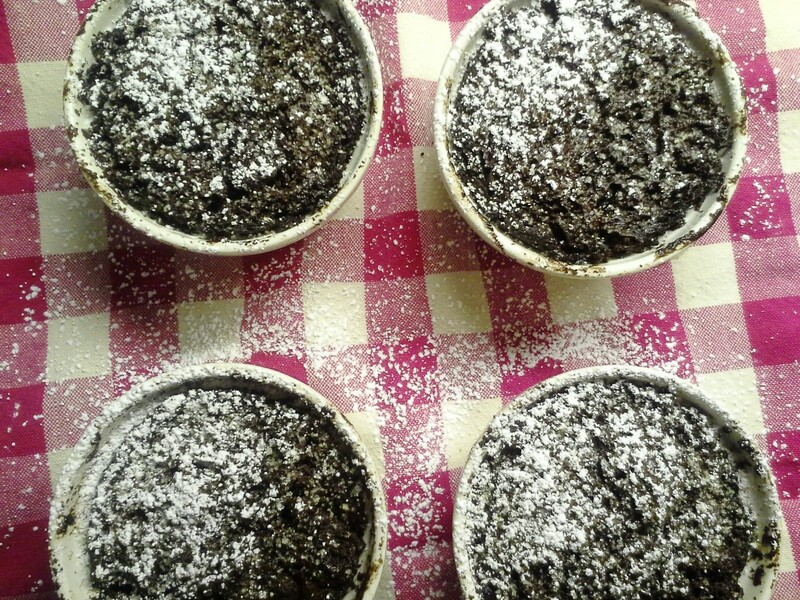 To make cake, in bowl, beat together sugar and butter with electric mixer until light and fluffy. In separate bowl, whisk together flour, baking powder, and salt. Add to butter mixture alternately with milk just until combined. Stir in cranberries. 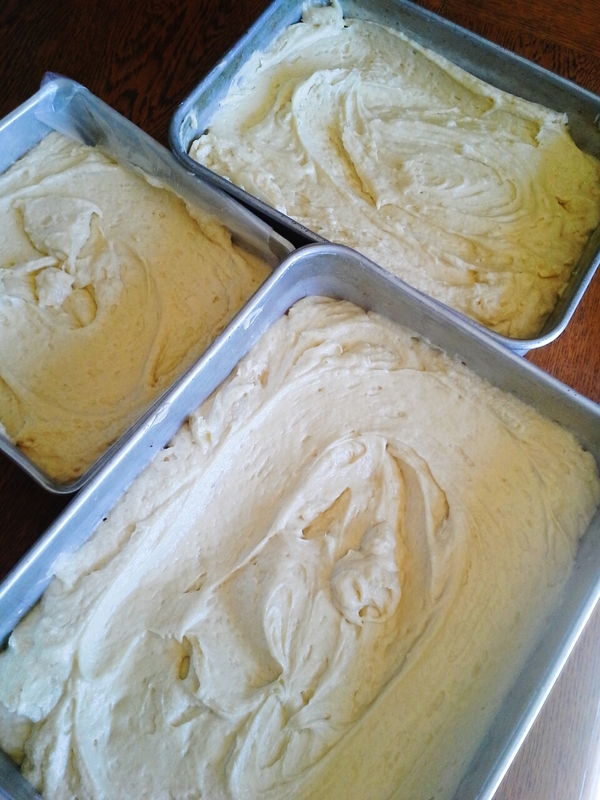 Divide batter evenly between loaf pans. Bake 35 to 4o minutes or until golden brown and toothpick inserted in center of cake comes out clean. To make sauce, in saucepan, combine sugar, butter, and cream. Bring to a gentle boil. Stir in vanilla. Serve alongside cake for pouring. Makes 12 servings. As much as I love playing in the kitchen, I’m a less-than-stellar baker. My cakes sometimes fall, my pie crusts often shrivel, and there’s usually at least one tray of cookies that burn. What I am good at coming up with solutions, so each “disaster” is most often edible–and even enjoyable–in the end. Today, though, I had to get it right. 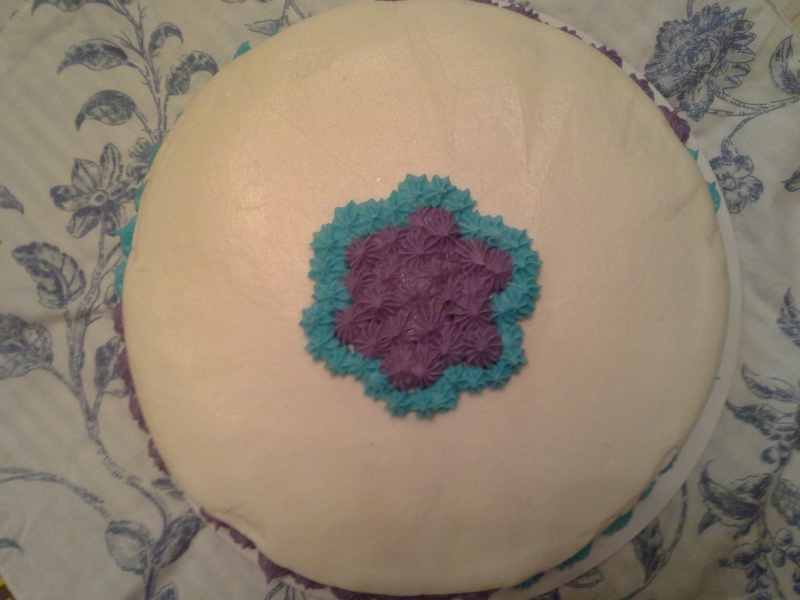 I signed on to take Cake Decorating 101 (I need help, remember?) from a local community ed program. Beki of Beki Cook’s Cakes sent out an email yesterday reminding students to bring an 8-inch cake to frost. (I’d spaced that critical piece of information, so was glad for the reminder.) Today was the day to bake my cake, and it had to be perfect–no tears, no crumbling. It would have to come out of the pan perfectly, something my cakes don’t always do. A few days back, I had read an intriguing article about making homemade cake mixes, so found a recipe online. I followed the recipe to the letter. (Well, almost. I did sub 1/2 cup buttermilk powder for the nonfat dried milk due to pantry inventory issues.) I also greased my cake pan and lined it with wax paper sprayed with cooking spray. No messing around–this needed to go well. Fortunately, it did. The cake baked up and browned nicely. 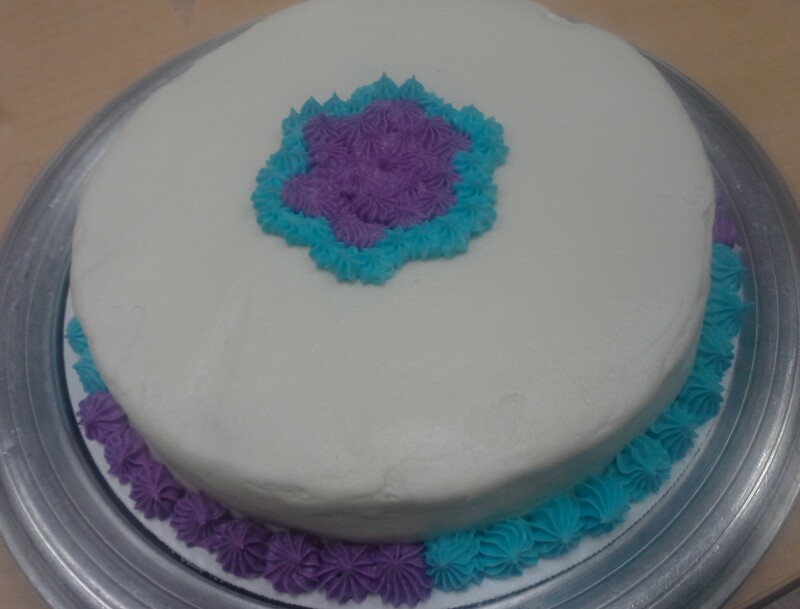 After cooling, it was time to take it to Frosting Class. I was excited to see what tips and tricks Beki would have; she did not disappoint. She walked us through coating (use lots of frosting), smoothing (first with a light touch and a spatula), drying (10 minutes stand time gives the frosted cake a nice “crust”), another round of smoothing (pressing oh-so-lightly with a non-embossed paper towel), and finally decorating with pastry bag and tips. Beki seemed a bottomless source of easy-to-follow practical decorating tips. For crumb-free frosting, always leave a layer of frosting between the spatula and cake, never letting the spatula touch the cake itself. When coloring frosting, use less icing gel (never liquid drops) than you think you’d need for pastels and more than you think you’d need for the deeper, darker colors. 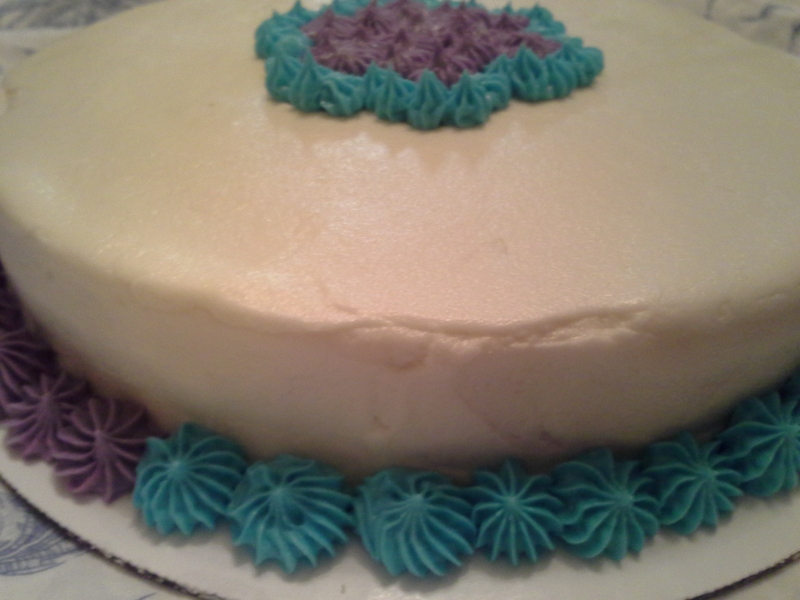 With only two hours of instruction, I was able to frost and decorate a great-looking cake–a personal best. For sure there are those of you (I’m talking to you, baking bloggers:-)), who can decorate far better than I, but I’m simply ecstatic that I could turn out such a pretty cake. I go back to Beki next week for the second half of the class. She showed me that decorating cakes well, with the right tips and tools, is accessible to anyone–even a non-artist and less-than-perfect baker such as myself.